Want to spend a cliche-free weekend in the Northern Capital? Let RIR's St. Petersburg-based expert show you how. St. Petersburg isn’t just the cultural capital of Russia: it’s also a tourist hotspot. Thousands of visitors from every corner of the globe converge on the city of Czar Peter the Great and Fyodor Dostoyevsky, in ever-increasing numbers. RBTH’s St. Petersburg-based expert has put together a schedule for weekenders heading to Russia’s northern capital. Sidestep the worn-out clichés without missing a thing! It’s worth starting your visit to St. Petersburg with a bird’s-eye view of the city. This is not as easy as it might sound, since there are almost no tall buildings in the city. Your best option is St. Isaac’s Cathedral — a building celebrated in the verses of the Russian classics, from Brodsky to Gumilev. You plod 330 feet up a narrow spiral staircase, but then a breath-taking city panorama opens out in front of you. The cathedral’s interior decorations are also deserving of your attention: it certainly deserves its reputation as one of the city’s most important landmarks. 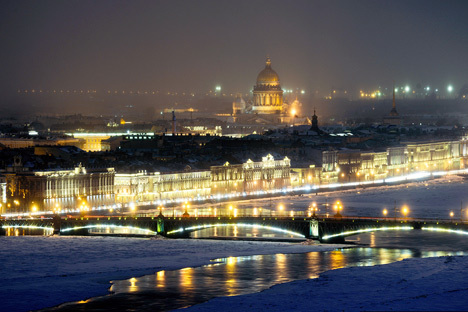 Unlike Moscow, St. Petersburg has a plethora of reasonably priced cafes and restaurants. There’s an especially great concentration of eateries of this kind in the area around St. Isaac’s Cathedral. One typically St. Petersburg place we’d recommend is Teplo, whose owners have set out to recreate the atmosphere of an old St. Petersburg apartment. These were the homes where the Soviet era’s most prominent intelligentsia would gather, giving birth to works of culture whose legacy has glorified this city to the world. Books line the shelves; there are toys, carpets and a soft but subtle light. In the summer, the quiet courtyard plays host to an outdoor terrace. The menu features both traditional Russian and European fare; borsch with smetana (beet soup with sour cream) goes for $8, while veal stroganoff with oyster and button mushrooms comes in at $13. You definitely need to book ahead! There are English-speaking staff members. After a hearty dinner, feel free to set off in search of fun amongst the bars and restaurants of Bolshaya Koniushennaya Ulitsa (Street). The street may not be that long, but it would still take you well over 24 hours to visit all the spots along it. There are five traditional-style English pubs alone! The locals love their pubs: St. Petersburg has 10 times the number of pubs as Moscow, and most of them more than pass muster in the authenticity contest. You might want to check out the Pregnant Spy’s Valise — more of an art happening than a restaurant. The cozy interiors are decked out with guns, traffic lights and old cars. We suggest a morning glimpse into Dom Knigi (House of Books), located in the former Singer Sewing Machine Head Office at the corner of Nevsky Prospekt (Avenue) and the Griboyedov Canal. Renovated two years ago, Dom Knigi is the city’s largest bookstore and one of the biggest in Europe. You can buy books about St. Petersburg here, or you can have a city-view breakfast at Cafe Singer on the upper floor. We turn our afternoon over to shopping. St. Petersburg’s most venerable retailer is Bolshoi Gostinny Dvor, whose history stretches back 300 years. It’s also worth popping into the Eliseyev Emporium, which more closely resembles some kind of museum. The shop was the backdrop for some of the scenes of the most recent television version of Bulgakov’s “The Master and Margarita.” The range of goods at Eliseyev’s are sure to satisfy the most discerning gourmet’s palate, with delicacies of every kind — cheeses, sausages, desserts and caviar in presentation wrapping. St. Petersburg is rightly called the cultural capital of Russia: museums and places of cultural interest have always been paramount here. Even so, as mentioned above, they are all liberally covered in the standard guidebooks. Instead, we would direct you toward the Loft-Project ÉTAGES cultural center. It’s the first and most well-known exhibition space in the city. It is laid out over five floors (or “étages” in Russian) in an old factory building. It is always teeming with energy here, and everyone will find something that interests them. In addition to the many exhibitions and art projects at ÉTAGES, you can also get something to eat, buy books and art albums, or even stay overnight at their hostel. After gorging on culture, make your way on foot to Rubinstein Ulitsa, which is home to more than 20 bars and restaurants. Here you’ll find places like the Doto Batono Georgian restaurant, or the Elephant Tapas-Bar. We have already mentioned that St. Petersburg is famous for its bars, but the city is hardly a clubbers paradise. The locals prefer to spend their evenings in quieter venues with their friends. If you still have the energy, you can head off for the Fontanka river embankment and its fashionable bars, like Mishka and Produkty. As the curtain comes down on our St. Petersburg weekend, we invite you to sample the authentic cuisine of the Idiot Cafe — right in the very city center, alongside St. Isaac’s Square and the Yusupov Palace. The cafe is named after Dostoyevsky’s novel “The Idiot,” and its interiors are laid out in the 19th-century style. It’s definitely one of the best places to try Russian food in the city, and on top of that, they have English-speaking staff. Russian pancakes with red caviar go for 390 rubles ($12), while cabbage soup as a hangover pick-me-up comes in at 290 rubles ($9).